North Korea has released the surveillance video it says shows an American university student stealing a propaganda banner bearing the name of Kim Jong-il—the state’s former leader—from the wall of his hotel. Otto Warmbier, 21, was sentenced on March 15 to 15 years of hard labor in a prison camp for the alleged crime. 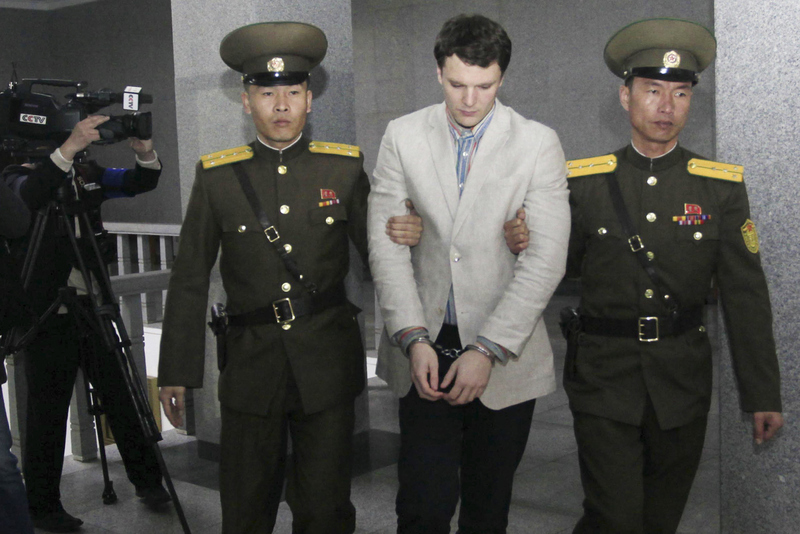 The video shows Warmbier, an undergraduate student from the University of Virginia, in a cramped area of the Yanggakdo International Hotel in Pyongyang, walking towards the wall before removing the rectangular poster. The morning of Jan. 1, according to a time stamp on a video image (which was also used as part of a witness testimony to help identify him), was when Warmbier committed the act of vandalism, reported the Daily Mail. “When I got off work, there was nothing amiss,” a second witness—a hotel staff member, told the court. Warmbier went to North Korea with a tour agency. He was stopped at the end of the five-day group tour at the airport and immediately got taken away, according to the tour operator that arranged the trip. In a tearful confession in February, Warmbier told press assembled in Pyongyang that his hometown church in Wyoming, Ohio—Friendship United Methodist Church—requested he steal the banner. The church member told Warmbier the banner would be hung on its wall as a trophy, but if things took an unexpected turn—such as him getting detained and not returning—$200,000 would be paid to his mother in the form of a charitable donation, Warmbier said. Warmbier pleaded with judges in court Wednesday, March 16, to ‘please think of my family’ right before he was sentenced. Warmbier also told reporters that he had also been influenced in his vandalism act by the university’s “Z Society,” which apparently he was trying to join. According to the Daily Mail, the magazine of the university’s alumni association said the Z Society is a “semi-secret ring society” that was founded in 1892. It conducts philanthropy, and puts on honorary dinners and grants academic awards. Warmbier pleaded with judges in court on March 16, to “please think of my family” right before he was sentenced. The White House said Warmbier’s sentence is “unduly harsh” and urged “immediate release” from jail on humanitarian grounds. Since the incident, the State Department has warned Americans against traveling to North Korea—even if, in the past, Americans have returned home without incident.